25 Aprile 2018 | in English. Seventy-three years ago Italy was liberated from Nazifascist oppression. The partisans were part of that generation that decided to fight fascism and struggle for a society more humane, free and just. A difficult venture for which many sacrificed their lives. Many more risked their lives, were arrested or tortured. Those who participated in the Resistance will forever remain an example of courage and humanity to the whole world. Today, the fight continues between those who struggle for a free, democratic and peaceful society and those who want to bring oppression and war in the name of racial or religious superiority. Just as before, there are those who are ready to close their eyes or to support fascism, in its different forms, for obtaining more power or profit. We decided to take a stand, on the side of the Resistance, and we know that we are not alone. In Italy and across the world our friends and comrades are taking part in workers’ struggles, student struggles, migrant struggles, the No Tav; everywhere there are people who desire a future more fair and humane. In Northern Syria, the same struggle that the partisans fought against fascism is being revived. The enemy is the same that was fought in our mountains more than 70 years ago, it has the same mentality, it has only changed its face: fascism today in Syria has the face of Erdogan, of ISIS and of al-Qaeda. Like all eras our politics and our governments repeatedly betray the values of the Resistance, because they make deals with fascist Turkey and they ignore its crimes – that is, when they don’t explicitly endorse them. For them the revolution in northern Syria must be destroyed because it represents the hope of a free and democratic society, in which peoples of all religions and ethnicities live together in peace. In this revolution the ideals of the partisans are revived and, inspired by their example, we came here from Italy to defend and contribute to that rich history of resistance. 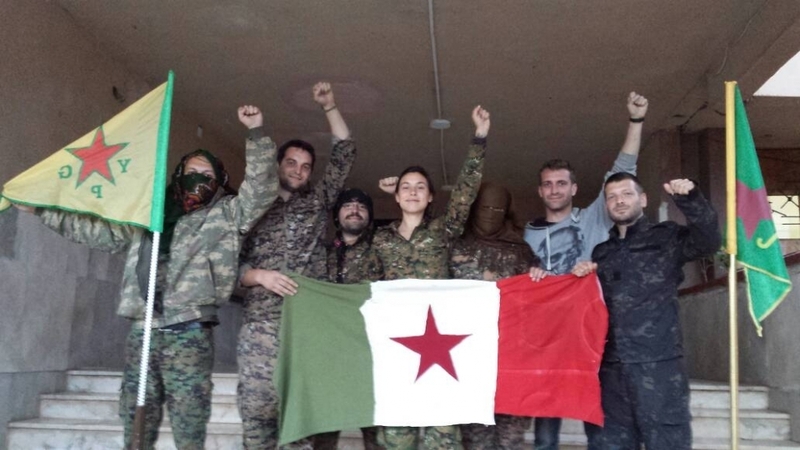 Upon hearing the stories of the resistance, our Kurdish, Arab, Assyrian and Turkmen comrades feel as though they are those of their comrades and friends, despite the distance in time and space. In the long nights passed at the front and under aerial bombardment, in daily work constructing a democratic and free society, often our minds wander to those who fought in the Resistance, in searching for a source of strength and courage to confront the fascism of today. The blood of the martyrs is our blood, their veins are our veins, and we will fight so that their values will never be defeated. Happy 25 April to all antifascists!